FastBack was a software application developed in the late 1980s and early 1990s for backing up IBM PC and Macintosh computers. It was originally written by Fifth Generation Systems Inc, a company located in Baton Rouge, Louisiana. When the company wanted to expand into the Apple market they purchased and rebranded a product from TouchStone Software Corporation. The original Fastback was unique in the industry in that it was able to read from a computer hard drive and write to the floppy drive simultaneously using the full capability of the dual-channel DMA chip found in personal computers of that time. 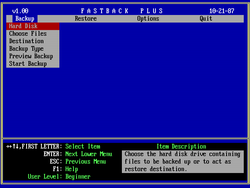 When combined with compression techniques and a proprietary disk format that got more data on each floppy disk, this easily made Fastback the fastest computer backup program of the time.